With the service area service, you can find the area that can be reached from the input location within a given travel time or travel distance. A service area is the area that encompasses all streets that can be accessed within a given distance or travel time from one or more locations, referred to as facilities. Service areas are generally used to visualize and measure the accessibility of facilities. For example, a three-minute drive-time polygon around a grocery store can determine which residents are able to reach the store within three minutes and are thus more likely to shop there. The service can also create multiple concentric service areas around one or more facilities that can show how accessibility changes with an increase in travel time or travel distance. It can be used, for example, to determine how many hospitals are within 5, 10, and 15 minute drive times of schools. When creating service areas based on travel times, the service can make use of traffic data, which can influence the area that can be reached during different times of the day. See Calculate drive time devlab to learn more on how to calculate drivable areas around a location using synchronous mode. The service area service supports synchronous and asynchronous execution modes. Asynchronous and synchronous modes define how the application interacts with the service and gets the result. When using the synchronous execution mode, the application must wait for the request to finish and get the results. This execution mode is well-suited for requests that complete quickly (under 10 seconds). When using the asynchronous execution mode, the client must periodically check if the service has finished execution and once completed get the result. While the service is executing, the application is free to do other things. This execution mode is well-suited for requests that take a long time to complete. While the service supports same functionality with both execution modes, the choice of the execution mode depends on the type of request your application has to make as well the size of problem you need to solve using the service. In synchronous mode, the service supports a maximum of 100 facilites in a single request. In asynchronous mode, the service supports a maximum of 1,000 facilites in a single request. So, for example, if you are generating service areas for less than 100 facilities, you can choose the synchronous execution mode. However, if your application needs to support more than 100 facilities, you need to use asynchronous execution mode. The request URL and the parameter names supported by the service when using asynchronous execution are different and described in the Service Area Service with Asynchronous Execution page. The maximum time an application can use the service area service when using the synchronous execution mode is 5 minutes (300 seconds). If your request does not complete within that time limit, the web server handling the request will timeout and return the appropriate HTTP error code in the response. If your requests need more time to complete, you should use the asynchronous execution mode which supports up to 1 hour (3,600 seconds) of usage time. The service works in all of the supported countries as listed in the data coverage page. One or more countries are grouped together to form a region. When you pass in your inputs, the service determines the region containing all of the inputs based on the location of the first facility in the facilities parameter. The service does not support requests that span more than one region. Consequently, service areas will be found only for those facilities that are in the same region as the first facility. The service area request takes the following parameters. The only required parameters are facilities, token and f. The optional parameters have default values which will be used if the parameter is not specified in the request. Specify one or more locations around which service areas are generated. Provides the identity of a user that has the permissions to access the service. Choose the mode of transportation for the analysis. Specify the size and number of service areas to generate for each facility. Specify whether the direction of travel used to generate the service areas is toward or away from the facilities. Specify whether travel times should consider traffic conditions. Specify the time zone or zones of the timeOfDay parameter. Specify the type of service areas. Specify whether multiple service areas around a facility are created as disks or rings. Specify if the service areas from different facilities can overlap each other. Specify if the service areas from different facilities that have the same break value should be joined together or split at break values. Specify if the service areas are trimmed. Specify the distance within which the service areas are trimmed. Specify if hierarchy should be used when generating service areas. Restrict or permit the route from making U-turns at junctions. Specify if the service should accumulate values other than the value specified as the impedanceAttributeName when generating service area lines. Specify which restrictions should be honored by the service. Specify additional values required by an attribute or restriction. Specify one or more points that act as temporary restrictions or represent additional time or distance that may be required to travel on the underlying streets. Specify one or more lines that prohibit travel anywhere the lines intersect the streets. Specify polygons that either completely restrict travel or proportionately scale the time or distance required to travel on the streets intersected by the polygons. specify if the service should create service area lines. Specify whether the service area lines from different facilities can overlap each other. Specify whether the service area lines should be split at break values. Specify whether facilities will be returned by the service. Specify whether barriers will be returned by the service. Specify whether polyline barriers will be returned by the service. Specify whether polygon barriers will be returned by the service. Specify whether invalid input locations should be ignored when finding the best solution. Specify the spatial reference of the geometries. Specify by how much you want to simplify the route geometry. Specify the units for the value specified for the outputGeometryPrecision parameter. Specify additional settings that can influence the behavior of the solver. Use this parameter to specify one or more locations around which service areas are generated. These locations are referred to as facilities. The service imposes a limit of 100 points that can be passed as facilities. If the value is exceeded, the response returns an error message. You can use a simple comma- and semicolon-based syntax if you need to specify only facility point geometries in the default spatial reference WGS84 such as the longitude and latitude values. url: Specify a REST query request to any ArcGIS Server feature, map, or geoprocessing service that returns a JSON feature set. This property is optional. However either features or url property must be specified. features: Specify an array of features. This property is optional. However, either the features or the url property must be specified. geometry: Specifies the facility geometry as a point containing x and y properties along with a spatialReference property. The spatialReference property is not required if the coordinate values are in the default spatial reference WGS84. If the coordinate values are in a different spatial reference, you need to specify the well-known ID (WKID) for the spatial reference. You can find the WKID for your spatial reference depending on whether the coordinates are represented in a geographic coordinate system or a projected coordinate system. attributes: Specify each attribute as a key-value pair where the key is the name of a given field, and the value is the attribute value for the corresponding field. Name: The name of the facility. The name is included in the service areas returned from the service. If the name is not specified, a unique name prefixed with Location is automatically generated. CurbApproach: Specifies the direction a vehicle may arrive at and depart from the facility. One of the integers listed in Coded value column in the following table must be specified as a value of this attribute. The values in the Setting column are the descriptive names for CurbApproach attribute values that you might have come across when using ArcGIS Network Analyst extension software. The vehicle can approach and depart the facility in either direction, so a U-turn is allowed at the facility. This setting can be chosen if it is possible and desirable for your vehicle to turn around at the facility. This decision may depend on the width of the road and the amount of traffic or whether the facility has a parking lot where vehicles can pull in and turn around. All arrival and departure combinations are allowed with the Either side of vehicle curb approach. When the vehicle approaches and departs the facility, the facility must be on the right side of the vehicle. A U-turn is prohibited. This is typically used for vehicles like busses that must arrive with the bus stop on the right hand side. The allowed arrival and departure combination for the Right side of vehicle curb approach. When the vehicle approaches and departs the facility, the facility must be on the left side of the vehicle. A U-turn is prohibited. This is typically used for vehicles like busses that must arrive with the bus stop on the left hand side. The allowed arrival and departure combination for the Left side of vehicle curb approach. When the vehicle approaches the facility, the facility can be on either side of the vehicle; however, when it departs, the vehicle must continue in the same direction it arrived in. A U-turn is prohibited. The allowed arrival and departure combinations for the No U-Turn curb approach. The CurbApproach property was designed to work with both kinds of national driving standards: right-hand traffic (United States) and left-hand traffic (United Kingdom). First, consider a facility on the left side of a vehicle. It is always on the left side regardless of whether the vehicle travels on the left or right half of the road. What may change with national driving standards is your decision to approach from the right or left side. For example, if you want to arrive at a facility and not have a lane of traffic between the vehicle and the facility, you would choose Right side of vehicle in the United States but Left side of vehicle in the United Kingdom. With right-hand traffic, the curb approach that leaves the vehicle closest to the facility is Right side of vehicle. With left-hand traffic, the curb approach that leaves the vehicle closest to the facility is Left side of vehicle. Attr_TravelTime: Specifies the time for cars, in minutes, that will be considered as delay impedance for the facility. Adding a value to this attribute reduces the reach of the service area. The attribute value can be used to store the amount of time spent at the facility. For example, when calculating service areas that represent fire station response times, Attr_TravelTime can store the turnout time for each fire station, which is the time it takes a crew to don the appropriate protective equipment and exit the fire station. Assume Fire Station 1 has a turnout time of two minutes and Fire Station 2 has a turnout time of three minutes. If a 5-minute service area is calculated for both fire stations, the actual service area for Fire Station 1 would be three minutes (since two of the five minutes would be required as turnout time). Similarly, Fire Station 2 would have an actual service area of only two minutes. The default value for Attr_TravelTime attribute is 0. Attr_TruckTravelTime: Specifies the amount of time for trucks, in minutes, that will be added to the total travel time of the service area at the facility. Adding a value to this attribute reduces the reach of the service area. The default value is 0. Attr_WalkTime: Specifies the amount of time for pedestrians, in minutes, that will be added to the total travel time of the service area at the facility. Adding a value to this attribute reduces the reach of the service area. The default value is 0. Attr_Miles: Specifies the distance in miles that will be considered as delay impedance for the facility. Adding a value to this attribute reduces the reach of the service area. Generally the locations of the facilities are not exactly on the streets but are set back somewhat from the road. This attribute value can be used to model the distance between the actual facility location and its location on the street if it is important to include that distance when generating service areas. The default value is 0. Attr_Kilometers: Specifies the distance in kilometers that will be considered as delay impedance for the facility. Adding a value to this attribute reduces the reach of the service area. Generally the locations of the facilities are not exactly on the streets but are set back somewhat from the road. This attribute value can be used to model the distance between the actual facility location and its location on the street if it is important to include that distance when generating service areas. The default value is 0. Breaks_TravelTime: Specify different break values for each facility. Given two facilities, this means you can generate 5- and 10- minute service areas for one facility and 6-, 9-, and 12-minute service areas for another facility. If Breaks_TravelTime is not set for a facility, the service will use the value specified as the defaultBreaks parameter. The value for the Breaks_TravelTime attribute allows the ability to overwrite the defaultBreaks parameter value on a per facility basis. The Breaks_TravelTime attribute is applicable when generating travel time based service areas and is used only if the impedanceAttributeName parameter is set to TravelTime (to model cars). The default value for this attribute is null which indicates the service to use the defaultBreaks parameter value. Breaks_TruckTravelTime: Specify different break values for each facility. Given two facilities, this means you can generate 5- and 10- minute service areas for one facility and 6-, 9-, and 12-minute service areas for another facility. If Breaks_TruckTravelTime is not set for a facility, the service will use the value specified as the defaultBreaks parameter. The value for the Breaks_TruckTravelTime attribute allows the ability to overwrite the defaultBreaks parameter value on a per facility basis. The Breaks_TruckTravelTime attribute is applicable when generating travel time based service areas and is used only if the impedanceAttributeName parameter is set to TruckTravelTime. The default value for this attribute is null which indicates the service to use the defaultBreaks parameter value. Breaks_WalkTime: Specify different break values for each facility. Given two facilities, this means you can generate 5- and 10- minute service areas for one facility and 6-, 9-, and 12-minute service areas for another facility. If Breaks_WalkTime is not set for a facility, the service will use the value specified as the defaultBreaks parameter. The value for the Breaks_WalkTime attribute allows the ability to overwrite the defaultBreaks parameter value on a per facility basis. The Breaks_WalkTime attribute is applicable when generating travel time based service areas and is used only if the impedanceAttributeName parameter is set to WalkTime (to model pedestrians). The default value for this attribute is null which indicates the service to use the defaultBreaks parameter value. Breaks_Miles: Specify different area break values for each facility. Given two facilities, this means you can generate 5- and 10- mile service areas for one facility and 6-, 9-, and 12- mile service areas for another facility. If Breaks_Miles is not set for a facility, the service will use the value specified as the defaultBreaks parameter. The value for the Breaks_Miles attribute allows the ability to overwrite the defaultBreaks parameter value on a per facility basis. The Breaks_Miles attribute is applicable when generating travel distance based service areas and is used only if the impedanceAttributeName parameter is set to Miles. The default value for this attribute is null which indicates the service to use the defaultBreaks parameter value. Breaks_Kilometers: Specify different area break values for each facility. Given two facilities, this means you can generate 5- and 10- kilometer service areas for one facility and 6-, 9-, and 12- kilometer service areas for another facility. If Breaks_Kilometers is not set for a facility, the service will use the value specified as the defaultBreaks parameter. The value for the Breaks_Kilometers attribute allows the ability to overwrite the defaultBreaks parameter value on a per facility basis. The Breaks_Kilometers attribute is applicable when generating travel distance based service areas and is used only if the impedanceAttributeName parameter is set to Kilometers. The default value for this attribute is null which indicates the service to use the defaultBreaks parameter value. Bearing: Specify the direction the vehicle or person is moving in. Bearing is measured clockwise from true north and must be in degrees. Typically, values are between 0 and 360; however, negative values are interpreted by subtracting them from 360 degrees. BearingTol: Short for bearing tolerance, this field specifies the maximum acceptable difference between the heading of a vehicle and a tangent line from the point on a street where Network Analyst attempts to locate the vehicle. The bearing tolerance is used to determine whether the direction in which a vehicle is moving generally aligns with the underlying road. If they align within the given tolerance, the vehicle is located on that edge; if not, the next nearest eligible edge is evaluated. The example also shows how to specify the Name attribute for each facility and specify a delay impedance for each facility using the Attr_TravelTime attribute. The geometries for facilities are in the default spatial reference, WGS84, and hence the spatialReference property is not required within the geometry property. Example 2: Specifying facility geometries in Web Mercator spatial reference using JSON structure. The example shows how to specify the Name attribute for each facility and specify the distance in miles between the actual facility location and its location on the street using the Attr_Miles attribute. The facility geometries are in the Web Mercator spatial reference and not in the default WGS84 spatial reference. Hence the spatialReference property is required within the geometry property. Example 3: Specifying facilities using URL. The URL makes a query for a few features from a map service. A URL querying features from a feature service can also be specified. Use this parameter to specify a token that provides the identity of a user that has the permissions to access the service. The accessing services page provides more information on how such an access token can be obtained. Use this parameter to specify the response format. The parameter can have json or pjson as arguments, for example, f=json. The pjson value is used for printing the JSON response in a pretty format. Travel modes are managed in ArcGIS Online and can be configured by the administrator of your organization to better reflect your organization's workflows. Learn more about travel modes. The value for the travelMode parameter is the JSON object containing the settings for a travel mode supported by your organization. To get the supported travel modes, execute the retrieveTravelModes operation. If you copy and paste the above URL into a web browser, you will get an invalid token error message. You need to replace <yourToken> with a valid token. See Accessing services provided by Esri to see how to generate one. Below is the response as returned by the retrieveTravelModes operation. Because the response is quite verbose, the elements in the response are abbreviated for clarity. From the above JSON , in order to pass Walking Time as the travel mode, use the following JSON as the value for the travelMode parameter. Usage of the above JSON object. When the travelMode parameter is set, you are choosing a travel mode configured in your organization, and the service automatically overrides the values of other parameters with values that model the chosen travel mode. The following parameters are overridden: impedanceAttributeName, attributeParameterValues, restrictUturns, useHierarchy, restrictionAttributeNames, outputGeometryPrecision, outputGeometryPrecisionUnits, and directionsTimeAttributeName. If you don't set travelMode, the service honors the default or user-defined values for the parameters that would otherwise be overridden, so you can create your own travel mode. Use this parameter to specify the size and number of service areas to generate for each facility. The service generates travel time or travel distance based service areas depending on the units for this parameter. If units are time based, the service areas are generated based on travel time along underlying streets. If units are distance based, the service areas are generated based on travel distances. The units for this parameter is based on the value of the impedanceAttributeName parameter. If impedanceAttributeName parameter is TravelTime, the values specified as defaultBreaks parameter are interpreted to be in minutes and the service generates time-based service areas. Otherwise the values are interpreted to be in miles or kilometers based on whether the impedanceAttributeName is set to Miles or Kilometers respectively and the service generates distance-based service areas. The service imposes a maximum defaultBreaks limit of 5 hours (300 minutes) when generating time-based service areas and a maximum limit of 300 miles (482.80 kilometers) when generating distance-based service areas. These limits are reduced to 15 minutes and 15 miles (24.14 kilometers), respectively, when generating detailed polygons (outputPolygons = esriNAOutputPolygonDetailed). If these values are exceeded, the response returns an error message. The parameter value is specified as a comma separated list of doubles. The values should always use a period as the decimal separator even in countries where traditionally a comma is used as the decimal separator. Multiple area breaks can be specified to create concentric service areas per facility. For instance, to find 2-, 3-, and 5- mile service areas for each facility, specify defaultBreaks=[2, 3, 5] and specify impedanceAttributeName to Miles. esriNATravelDirectionFromFacility: The service area is generated in the direction away from the facilities. esriNATravelDirectionToFacility: The service area is created in the direction towards the facilities. The direction of travel may change the shape of the service areas because travel times on opposite sides of streets may differ or one-way restrictions may exist, such as one-way streets. The direction you should choose depends on how you want to use service areas in your analysis. The service area for a pizza delivery store, for example, should be created away from the facility, whereas the service area of a hospital should be created toward the facility. The default value for this parameter is esriNATravelDirectionFromFacility. Specify whether travel times should consider traffic conditions. To use traffic in the analysis, set impedanceAttributeName to TravelTime, and assign a value to timeOfDay. The timeOfDay value represents the time at which travel begins from the input facilities. The time is specified as Unix time (milliseconds since midnight, January 1 1970). The interpretation of the parameter value depends on whether travel is toward or away from the facilities as specified by the travelDirection parameter. It represents the departure time if travelDirection is set to esriNATravelDirectionFromFacility. This is the default. It represents the arrival time if travelDirection is set to esriNATravelDirectionToFacility. If a time of day is not passed in, the service uses static road speeds based on average historical speeds or posted speed limits. It uses posted speeds in areas where historical traffic information isn't available. Traffic is supported only with the driving time impedance or travel mode. It's not supported with trucking. The service supports two kinds of traffic: typical and live. Typical traffic references travel speeds that are made up of historical averages for each five-minute interval spanning a week. Live traffic retrieves speeds from a traffic feed that processes phone probe records, sensors, and other data sources to record actual travel speeds and predict speeds for the near future. The Data Coverage page shows the countries Esri currently provides traffic data for. Set the time and date as Unix time in milliseconds. For example, to solve for 1:03 p.m. on Thursdays, set the time and date to 1:03 p.m., 4 January 1990; and convert to milliseconds (631458180000). Although the dates representing days of the week are from 1990, typical traffic is calculated from recent traffic trends—usually over the last several months. To use live traffic when and where it is available, choose a time and date and convert it to Unix time. Esri saves live traffic data for 12 hours and references predictive data extending 12 hours into the future. If the time and date you specify for this parameter is outside the 24-hour time window, or the travel time in the analysis continues past the predictive data window, the task falls back to typical traffic speeds. All points in facilities need to be in the same time zone if overlapPolygons is set to false. This parameter is ignored when impedanceAttributeName is set to distance units. The time zone for timeOfDay can be UTC or the time zone or zones in which the points in facilities are located. Specify time zones with the startTimeIsUTC parameter. "timeOfDay": 631458180000 // 13:03, 4 January 1990. Typical traffic on Thursdays at 1:03 p.m.
"timeOfDay": 631731600000 // 17:00, 7 January 1990. Typical traffic on Sundays at 5:00 p.m.
"timeOfDay": 1413964800000 // 8:00, 22 October 2014. If the current time is between 8:00 p.m., 21 Oct. 2014 and 8:00 p.m., 22 Oct. 2014, live traffic speeds are referenced in the analysis; otherwise, typical traffic speeds are referenced. "timeOfDay": 1426674000000 // 10:20, 18 March 2015. If the current time is between 10:20 p.m., 17 Mar. 2015 and 10:20 p.m., 18 Mar. 2015, live traffic speeds are referenced in the analysis; otherwise, typical traffic speeds are referenced. Specify the time zone or zones of the timeOfDay parameter. There are two options: false (default) and true. The timeOfDay value refers to the time zone or zones in which the input points are located. This option causes the analysis to have rolling start times across time zones. The timeOfDay value refers to Coordinated Universal Time (UTC). The start times for all points are simultaneous, regardless of time zones. Illustration of setting the value to true (UTC): Setting timeOfDay to 9:00 a.m., 4 January 1990 (631443600000 milliseconds) and to true, the start time for points in the Eastern Time Zone is 4:00 a.m. Eastern Time and 3:00 a.m. Central Time for those in the Central Time Zone. esriNAOutputPolygonNone: Do not generate service areas. This is useful in cases where you don't want to generate areas around facilities, but instead, just want to generate service area lines. esriNAOutputPolygonDetailed: Create detailed service areas. esriNAOutputPolygonSimplified: Create generalized service areas. Detailed service areas model the service areas more accurately and thus may result in islands of unreached areas in certain cases. Generalized service areas are fairly accurate for most cases. However, in some cases, creating generalized service areas may cover islands of unreached areas and would be undesirable if your goal is to find such islands. If your facilities are in an urban area with a grid-like street network, the difference between generalized and detailed service areas would be minimal. However, if your facilities are in a region containing mountain and rural roads, the detailed service areas may present significantly more accurate results than generalized service areas. Detailed service areas are not supported when using hierarchy. So, specifying esriNAOutputPolygonDetailed for the outputPolygons and true for the useHierarchy parameters results in a failed request. Also, the service doesn't support generating detailed polygons that have defaultBreaks larger than 15 minutes or 15 miles (24.14 kilometers). The default value for this parameter is esriNAOutputPolygonSimplified. Use this parameter to specify whether multiple service areas around a facility are created as disks or rings. A parameter value of true specifies that when creating multiple service areas around a facility, do not include the region covered by the smaller service area into the region covered by the larger service area. Use this option if you want to find the area from one break to another. For instance, If you create 5- and 10-minute service areas, then the 10-minute service areas will exclude the area under the 5-minute service areas and thus would appear like rings. A parameter value of false specifies that when creating multiple service areas around a facility, create service areas going from the facility to the break. For instance, If you create 5- and 10-minute service areas, then the 10-minute service area will include the area under the 5-minute service area . Using either option will produce the same result when only one break value is specified. The default value for this parameter is true. Use this parameter to specify if the service areas from different facilities can overlap each other. A parameter value of true specifies that the services areas can overlap each other. A parameter value of false specifies that that a service area from one facility cannot overlap service areas from other facilities. With this option, the area inside any given service area is closer to the corresponding facility than any other facility. This parameter will produce same results with either values when you have only one facility. Use this parameter to specify if the service areas from different facilities that have the same break value should be joined together or split at break values. A parameter value of true specifies that the services areas will be split at break values resulting in individual service areas for each facility. A parameter value of false specifies that the service areas will be joined together resulting in one area per break value for each facility. This parameter will produce same results with either values when you have only one facility. Use this parameter to specify if the service areas are trimmed. A parameter value of true specifies that the service areas will be trimmed. This is useful when finding service areas in places that have very sparse street network and you don't want the service area to cover large areas where there are no street features. A parameter value of false specifies that the service areas will not be trimmed. The parameter value is ignored when useHierarchy parameter is set to true. The default value for this parameter is true. Use this parameter to specify the distance within which the service areas are trimmed. This parameter is applicable only if trimOuterPolygons parameter is set to true. The parameter value is ignored when useHierarchy parameter is set to true. The default value for this parameter is 100. This parameter is applicable only if trimOuterPolygons parameter is set to true. The parameter value is ignored when useHierarchy parameter is set to true. The default value for this parameter is esriNAUMeters. Use this parameter to specify if hierarchy should be used when generating service areas. The value of this parameter, regardless of whether you rely on the default or explicitly set a value, is overridden when you pass in travelMode. A parameter value of true indicates that the service should use hierarchy. When generating hierarchical service areas, the service prefers higher-order streets such as freeways to lower-order streets such as local roads. This means that if a facility is located on a local road (the lowest level in a hierarchy), the service spans out on the local roads in that area, but it tries to step up the hierarchy to secondary and primary roads. Once on secondary and primary roads, the service ignores local roads throughout the rest of the service area. Mainly because of this hierarchical approach, hierarchical service areas are generated much faster as compared to non-hierarchical service areas as the service has to generate service areas from a relatively smaller subset of streets. Hierarchical service areas can be used to simulate the driver preference of traveling on freeways instead of local roads even if that means a longer trip. However, the areas can overlap some lower-order roads that can't truly be reached within the given travel distance or travel time. So hierarchical service areas can be less accurate. A parameter value of false indicates that the service should use not hierarchy. This results in service areas that are measured along all the streets regardless of hierarchy level and tend to be superior in quality as compared to their hierarchical counterparts. The service automatically reverts to using hierarchy, even if you have chosen not to use it, when the largest value specified in the defaultBreaks parameter equates to a time or distance that is greater than 60 minutes or 60 miles. If the detailed_polygons parameter is set to true or the polygons_for_multiple_facilities parameter is set to Not Overlapping or Merge by Break Value, the service reverts to using hierarchy if the largest break value is greater than 15 minutes or 15 miles. Some service parameters are not applicable when generating heirarchical service areas. The trimOuterPolygons, trimPolygonDistance, and the trimPolygonDistanceUnits parameters are ignored and, if specified, result in a warning message in the service response. Generating detailed service areas, specified using a value of esriNAOutputPolygonDetailed for the outputPolygons parameter, is not supported and results in a failed request. Generating service area lines, specified using esriNAOutputLineTrueShape or esriNAOutputLineTrueShapeWithMeasure for the outputLines parameter, is not supported and results in a failed request. Use this parameter to restrict or permit the route from making U-turns at junctions. U-turns are permitted everywhere. Allowing U-turns implies that the vehicle can turn around at a junction and double back on the same street. U-turns are permitted at junctions with any number of adjacent streets. U-turns are prohibited at junctions where exactly two adjacent streets meet. U-turns are permitted only at intersections or dead ends. U-turns are prohibited at all junctions and interesections and are permitted only at dead ends. U-turns are permitted only at dead ends. U-turns are prohibited at all junctions, intersections, and dead-ends. Note that even when this parameter value is chosen, a route can still make U-turns at stops. If you wish to prohibit U-turns at a stop, you can set its CurbApproach property to the appropriate value (3). Impedance is a value that quantifies travel along the transportation network. Travel distance is an example of impedance; it quantifies the length of walkways and road segments. Similarly, drive time—the typical time it takes to drive a car along a road segment—is an example of impedance. Drive times may vary by type of vehicle—for instance, the time it takes for a truck to travel along a path tends to be longer than a car—so there can be many impedance values representing travel times for different vehicle types. Impedance values may also vary with time; live and historical traffic reference dynamic impedance values. Each walkway and road segment stores at least one impedance value. When performing a network analysis, the impedance values are used to calculate the best results, such as finding the shortest route—the route that minimizes impedance—between two points. TravelTime (default)—Models travel times for a car. These travel times can be dynamic, fluctuating according to traffic flows, in areas where traffic data is available. TruckTravelTime—Models travel times for a truck. These travel times are static for each road and don't fluctuate with traffic. WalkTime—Models travel times for a pedestrian. The default walking speed is 5 kilometers per hour (3.1 miles per hour), but you can change that speed through the attributeParameterValues parameter by setting Walking Speed (km/h) to a different value. Miles—Specifies that the travel distance between the stops should be minimized. The total distance between the stops is calculated in miles. Kilometers—Specifies that the travel distance between the stops should be minimized. The total distance between the stops is calculated in kilometers. Use this parameter to specify if the service should accumulate values other than the value specified as the impedanceAttributeName when generating service area lines. For example, You might want to generate service area lines based on travel distance and accumulate travel time. The service area lines are based on distance, but they also specify how long it would take to reach a portion of the service area. The values specified for the accumulateAttributeNames parameter are purely for reference. The service only uses the value specified for the impedanceAttributeName parameter when generating service areas. The parameter value is specified as a comma separated list of names. The possible parameter values are same as the impedanceAttributeName parameter. A value of none indicates not to accumulate any values. For each value specified in the accumulateAttributeNames parameter, two attributes are added to the saLines object in the response. For example, if accumulateAttributeNames parameter is set to Miles, Kilometers, the saLines object in the response includes FromCumul_Miles, ToCumul_Miles, FromCumul_Kilometers and ToCumul_Kilometers attributes. The default value for this parameter is none. The parameter value is ignored if the outputLines parameter is set to esriNAOutputLineNone. Use this parameter to specify which restrictions should be honored by the service. A restriction represents a driving preference or requirement. In most cases, restrictions cause roads or pathways to be prohibited, but they can also cause them to be avoided or preferred. For instance, using an Avoid Toll Roads restriction will result in a route that will include toll roads only when it is absolutely required to travel on toll roads in order to visit a stop. Height Restriction makes it possible to route around any clearances that are lower than the height of your vehicle. If you are carrying corrosive materials on your vehicle, using the Any Hazmat Prohibited restriction prevents hauling the materials along roads where it is marked as illegal to do so. The parameter value is specified as a comma-separated list of restriction names. For example, the default value for this parameter is restrictionAttributeNames=Avoid Carpool Roads, Avoid Express Lanes, Avoid Gates, Avoid Private Roads, Avoid Unpaved Roads, Driving an Automobile, Roads Under Construction Prohibited, Through Traffic Prohibited. A value of none indicates that no restrictions should be used when finding shortest paths. Some restrictions are supported only in certain countries as indicated by the Availability column in the table. A restriction is supported in a country if the Logistics Attribute column has a value of Yes in the list of supported countries. If you specify restriction names that are not available in the country where your input points are located, the service ignores the invalid restrictions and returns warning messages indicating the names for the restrictions that were not considered when making measurements. Sometimes you need to specify an additional value, the restriction attribute parameter, on a restriction to get the intended results. This value needs to be associated with the restriction name and a restriction parameter using attributeParameterValues. The route will not include roads where transporting any kind of hazardous material is prohibited. The route will avoid roads that are designated exclusively for carpool (high-occupancy) vehicles. The route will avoid roads designated as express lanes. The route will avoid ferries. The route will avoid roads where there are gates such as keyed access or guard controlled entryways. The route will avoid roads that are limited access highways. The route will avoid roads that are not publicly owned and maintained. The route will avoid toll roads. The route will avoid roads where trucks are not allowed except when making deliveries. The route will avoid roads that are not paved (for example, dirt, gravel, etc.). The route will not include roads where trucks with the specified number of axles are prohibited. The number of axles can be specified using the Number of Axles restriction parameter. The route will not include roads where buses are prohibited. Using this restriction will also ensure that the route will honor one-way streets. The route will not include roads where delivery vehicle are prohibited. Using this restriction will also ensure that the route will honor one-way streets. The route will not include roads where taxis are prohibited. Using this restriction will also ensure that the route will honor one-way streets. The route will not include roads where trucks are prohibited. Using this restriction will also ensure that the route will honor one-way streets. The route will not include roads where automobiles are prohibited. Using this restriction will also ensure that the route will honor one-way streets. The route will not include roads where emergency vehicles are prohibited. Using this restriction will also ensure that the route will honor one-way streets. The route will not include roads where the vehicle height exceeds the maximum allowed height for the road. The vehicle height can be specified using the Vehicle Height (meters) restriction parameter. The route will not include roads where the vehicle length exceeds the maximum allowed kingpin to rear axle for all trucks on the road. The length between the vehicle kingpin and the rear axle can be specified using the Vehicle Kingpin to Rear Axle Length (meters) restriction parameter. The route will not include roads where the vehicle length exceeds the maximum allowed length for the road. The vehicle length can be specified using the Vehicle Length (meters) restriction parameter. The route prefers paths designated for pedestrians. The route will not include roads where motorcycles are prohibited. Using this restriction will also ensure that the route will honor one-way streets. The route will not include roads that are under construction. The route will not include roads where semis or tractors with one or more trailers are prohibited. The route will not include roads where vehicles with single axles are prohibited. The route will not include roads where vehicles with tandem axles are prohibited. The route will not include roads where through traffic (non-local) is prohibited. The route will not include roads where trucks with the specified number of trailers on the truck are prohibited. The number of trailers on the truck can be specified using the Number of Trailers on Truck restriction parameter. The route will prefer roads that are designated for transporting any kind of hazardous materials. The route will prefer roads that are designated as trucks routes such as the roads that are part of the national network as specified by the National Surface Transportation Assistance Act in the United States, or roads that are designated as truck routes by the state or province, or roads that are preferred by the trucks when driving in an area. The route will not include roads where pedestrians are prohibited. The route will not include roads where the vehicle weight exceeds the maximum allowed weight for the road. The vehicle weight can be specified using the Vehicle Weight (kilograms) restriction parameter. The route will not include roads where the vehicle weight per axle exceeds the maximum allowed weight per axle for the road. The vehicle weight per axle can be specified using the Vehicle Weight per Axle (kilograms) restriction parameter. The route will not include roads where the vehicle width exceeds the maximum allowed width for the road. The vehicle width can be specified using the Vehicle Width(meters) restriction parameter. Driving a Delivery Vehicle restriction attribute is deprecated and will be unavailable in future releases. To achieve similar results, use Driving a Truck restriction attribute along with Avoid Truck Restricted Roads restriction attribute. Use this parameter to specify additional values required by an attribute or restriction, such as to specify whether the restriction prohibits, avoids, or prefers travel on restricted roads. If the restriction is meant to avoid or prefer roads, you can further specify the degree to which they are avoided or preferred using this parameter. parameterName—The name of the parameter associated with the restriction. A restriction can have one or more parameterName properties. Prohibited (-1)—Travel on the roads that have the restriction is completely prohibited. Avoid_High (5)—It is very unlikely for the service to include in the route the roads that are associated with the restriction. Avoid_Medium (2)—It is unlikely for the service to include in the route the roads that are associated with the restriction. Avoid_Low (1.3)—It is somewhat unlikely for the service to include in the route the roads that are associated with the restriction. Prefer_Low (0.8)—It is somewhat likely for the service to include in the route the roads that are associated with the restriction. Prefer_Medium(0.5)—It is likely for the service to include in the route the roads that are associated with the restriction. Prefer_High (0.2)—It is very likely for the service to include in the route the roads that are associated with the restriction. The restrictionAttributeNames parameter is associated with attributeParameterValues. The restriction attribute's parameter value is specified as part of attributeParameterValues. Each restriction has at least one parameter named Restriction Usage, which specifies whether travel on roads that have the restriction is prohibitied, should be avoided, or should be preferred. For the latter two options, it also specifies the degree to which the roads are avoided or preferred. In most cases, you can use the default value, Prohibit, for the Restriction Usage if the restriction is dependent on a physical vehicle-characteristic such as vehicle height. However, in some cases, the value for Restriction Usage depends on your routing preferences. For example, the Avoid Toll Roads restriction has the default value of Avoid_Medium for the Restriction Usage parameter. This means that when the restriction is used, the service will try to route around toll roads when it can. Avoid_Medium also indicates how important it is to avoid toll roads when finding the best route; it has a medium priority. Choosing Avoid_Low would put lower importance on avoiding tolls; choosing Avoid_High instead would give it a higher importance and thus make it more acceptable for the service to generate longer routes to avoid tolls. Choosing Prohibited would entirely disallow travel on toll roads, making it impossible for a route to travel on any portion of a toll road. Keep in mind that avoiding or prohibiting toll roads, and thus avoiding toll payments, is the objective for some; in contrast, others prefer to drive on toll roads because avoiding traffic is more valuable to them than the money spent on tolls. In the latter case, you would choose Prefer_Low, Prefer_Medium, or Prefer_High as the value for Restriction Usage. The higher the preference, the farther the service will go out of its way to travel on the roads associated with the restriction. The following table lists the attribute parameter names and the default parameter values. If you wish to use the default value for a restriction parameter, the restriction name, restriction parameter name, and restriction parameter value do not have to be specified as part of the attributeParameterValues. This example shows how to specify the height and weight of the vehicle for use with the height and weight restrictions respectively along with a high preference to include the designated truck routes. This results in a route that does not include any roads where the clearance under overpasses or through tunnels is less than the vehicle height. The route will also not include any roads with load limited bridges or local roads that prohibit heavy vehicles if the vehicle weight exceeds the maximum permissible weight. However, the route will include as many roads as possible that are designated as preferred truck routes. Note that the Restriction Usage parameter for the Height Restriction and the Weight Restriction are not specified as we want to use the default value of Prohibit for these restriction parameters. Use this parameter to specify one or more points that act as temporary restrictions or represent additional time or distance that may be required to travel on the underlying streets. For example, a point barrier can be used to represent a fallen tree along a street or time delay spent at a railroad crossing. The service imposes a maximum limit of 250 point barriers. If the value is exceeded, the response returns an error message. The barriers parameter can be specified using a simple comma- and semicolon-based syntax if you need to specify only point barrier geometries as longitude and latitude values in the default spatial reference (WGS84). url: Specify a REST query request to any ArcGIS Server feature, map, or geoprocessing service that returns a JSON feature set. This property is optional. However either the features or the url property must be specified. geometry: Specifies the barrier geometry as a point containing x and y properties along with a spatialReference property. The spatialReference property is not required if the coordinate values are in the default spatial reference WGS84. If the coordinate values are in a different spatial reference, you need to specify the well-known ID (WKID) for the spatial reference. You can find the WKID for your spatial reference depending on whether the coordinates are represented in a geographic coordinate system or a projected coordinate system. Name: The name of the barrier. BarrierType: Specifies whether the point barrier restricts travel completely or adds time or distance when it is crossed. The value for this attribute is specified as one of the following integers. 0 - Prohibits traversing through the barrier. The barrier is referred to as restriction point barrier since it acts as a restriction. This is the default value. The map on the left shows the shortest path between two stops without any restriction point barriers. The map on the right has a road that is blocked by a fallen tree, so the shortest path between the same points is longer. 2 - Traveling through the barrier increases the travel time or distance by the amount specified as the value for Attr_TravelTime, Attr_Miles, or Attr_Kilometers attributes. This barrier type is referred to as an added cost point barrier. The map on the left shows the shortest path between two stops without any added cost point barrier. For the map on the right, the travel time from stop one to stop two would be the same whether going around the north end of the block or the south end; however, since crossing railroad tracks incurs a time penalty (modeled with added cost point barriers), the route with only one railroad crossing is chosen. The cost of crossing the barrier is added to the accumulated travel time of the resulting route. There is no point barrier type with a value of 1 for the BarrierType attribute. FullEdge: This attribute is applicable only for restriction point barriers. The value for this attribute is specified as one of the following integers. 0 - Permits travel on the edge up to the barrier, but not through it. This is the default value. 1 - Restricts travel anywhere on the underlying street. Attr_TravelTime: Indicates how much travel time in minutes is added when the barrier is traversed. This attribute is applicable only for added-cost barriers. The attribute value must be greater than or equal to zero. Attr_Miles: Indicates how much distance in miles is added when the barrier is traversed. This attribute is applicable only for added-cost barriers. The attribute value must be greater than or equal to zero. Attr_Kilometers: Indicates how much distance in kilometers is added when the barrier is traversed. This attribute is applicable only for added-cost barriers. The attribute value must be greater than or equal to zero. Example 1: Specifying added cost point barrier using JSON structure. This example shows how to use an added cost point barrier to model a 5 minute delay at a rail road crossing. The BarrierType attribute is used to specify that the point barrier is of type added cost and the Attr_TravelTime attribute is used to specify the delay in minutes. The barrier geometry is in the default spatial reference, WGS84, and hence the spatialReference property is not required within the geometry property. Example 2: Specifying restriction point barrier using URL. Use this parameter to specify one or more lines that prohibit travel anywhere the lines intersect the streets. For example, a parade or protest that blocks traffic across several street segments can be modeled with a line barrier. A line barrier can also quickly fence off several roads from being traversed, thereby channeling possible routes away from undesirable parts of the street network. The map on the left displays the shortest path between two stops. The map on the right shows the shortest path when several streets are blocked by a polyline barrier. The service imposes a limit on the number of streets you can restrict using polylineBarriers parameter. While there is no limit on number of lines you can specify as polyline barriers, the combined number of streets intersected by all the lines should not exceed 500. If the value is exceeded, the response returns an error message. geometry: Specifies the barrier geometry. The structure is based on ArcGIS REST polyline object. A polyline contains an array of paths and a spatialReference. Each path is represented as an array of points, and each point in the path is represented as an array of numbers containing X and Y coordinate values at index 0 and 1 respectively. The spatialReference property is not required if the coordinate values are in the default spatial reference WGS84. If the coordinate values are in a different spatial reference, you need to specify the well-known ID (WKID) for the spatial reference. You can find the WKID for your spatial reference depending on whether the coordinates are represented in a geographic coordinate system or a projected coordinate system. Name: The name of the polyline barrier. Example 1: Specifying polyline barriers using JSON structure. 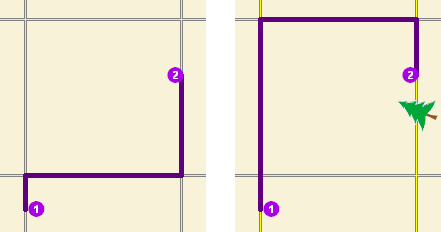 The example shows how to add two lines as polyline barriers to restrict travel on the streets intersected by the lines. Barrier 1 is a single-part line feature made up of two points. Barrier 2 is a two-part line feature. The first part is made up of three points, and the second part is made up of two points. The barrier geometries are in the Web Mercator spatial reference and not in the default WGS84 spatial reference. Hence, the spatialReference property is required within the geometry property. Example 2: Specifying polyline barrier using URL. Use this parameter to specify polygons that either completely restrict travel or proportionately scale the time or distance required to travel on the streets intersected by the polygons. The service imposes a limit on the number of streets you can restrict using the polygonBarriers parameter. While there is no limit on number of polygons you can specify as the polygon barriers, the combined number of streets intersected by all the polygons should not exceed 2,000. If the value is exceeded, the response returns an error message. url: Specify a REST query request to any ArcGIS Server feature, map, or geoprocessing service that returns a JSON feature set. This property is optional. However, either the features or the url property must be specified. geometry: Specifies the barrier geometry. The structure is based on ArcGIS REST polygon object. A polygon contains an array of rings and a spatialReference. The first point of each ring is always the same as the last point. Each point in the ring is represented as an array of numbers containing X and Y coordinate values at index 0 and 1 respectively. The spatialReference property is not required if the coordinate values are in the default spatial reference WGS84. If the coordinate values are in a different spatial reference, you need to specify the well-known ID (WKID) for the spatial reference. You can find the WKID for your spatial reference depending on whether the coordinates are represented in a geographic coordinate system or a projected coordinate system. 0 - Prohibits traveling through any part of the barrier. The barrier is referred to as restriction polygon barrier since it prohibits traveling on streets intersected by the barrier. One use of this type of barrier is to model floods covering areas of the street that make traveling on those streets impossible. This is the default value. The left side depicts the shortest path between two stops. On the right, a polygon barrier blocks flooded streets, so the shortest path between the same two stops is different. 1 - Scales the time or distance required to travel the underlying streets by a factor specified using the Attr_TravelTime, Attr_Miles, or Attr_Kilometers attributes. If the streets are partially covered by the barrier, the travel time or distance is apportioned and then scaled. For example, a factor 0.25 would mean that travel on underlying streets is expected to be four times faster than normal. A factor of 3.0 would mean it is expected to take three times longer than normal to travel on underlying streets. This barrier type is referred to as scaled cost polygon barrier. It might be used to model storms that reduce travel speeds in specific regions. The map on the left shows a route that goes through inclement weather without regard for the effect poor road conditions have on travel time. On the right, a scaled polygon barrier doubles the travel time of the roads covered by the storm. Notice the route still passes through the southern tip of the storm since it is quicker to spend more time driving slowly through a small part of the storm rather than driving completely around it. The service uses the modified travel time in calculating the best route; furthermore, the modified travel time is reported as the total travel time in the response. Attr_TravelTime: This is the factor by which the travel time of the streets intersected by the barrier is multiplied. This attribute is applicable only for scaled-cost barriers. You should specify this attribute if the impedanceAttributeName request parameter has the value TravelTime. The attribute value must be greater than zero. Attr_Miles: This is the factor by which the distance of the streets intersected by the barrier is multiplied. This attribute is applicable only for scaled-cost barriers. You should specify a value for this attribute if the impedanceAttributeName request parameter has the value Miles. The attribute value must be greater than zero. Attr_Kilometers: This is the factor by which the distance of the streets intersected by the barrier is multiplied. This attribute is applicable only for scaled-cost barriers. You should specify a value for this attribute if the impedanceAttributeName request parameter has the value Kilometers. The attribute value must be greater than zero. Example 1: Specifying polygon barriers using JSON structure. The example shows how to add two polygons as barriers. The first polygon named Flood zone is a restriction polygon barrier that prohibits travel on the underlying streets. The polygon is a single-part polygon feature made up of four points. The second polygon named Severe weather zone is a scaled-cost polygon barrier that reduces the travel time on underlying streets to one third of the original value. The polygon is a two-part polygon feature. Both parts are made up of four points. The barrier geometries are in the default spatial reference, WGS84. Hence, the spatialReference property is not required within geometry property. Example 2: Specifying polygon barrier using URL. esriNAOutputLineNone: Do not generate service area lines. This is useful in cases where you don't want to generate area lines around facilities, but instead, just want to generate service areas. esriNAOutputLineTrueShape: Create service area lines based on the streets that fall within the values specified as the breakValues parameter. esriNAOutputLineTrueShapeWithMeasure: create measures for your service area lines. This adds linear referencing information to the output lines to aid in the usage of service area lines for functions such as dynamic segmentation for events. If esriNAOutputLineTrueShape and esriNAOutputLineTrueShapeWithMeasure values are used when useHierarchy parameter is set totrue, the service returns a failed request. This is also the case when the service enforces the use of hierarchy under certain conditions, for example, when the largest value for defaultBreaks is greater than 15 minutes or miles for car or truck travel modes. The default value for this parameter is esriNAOutputLineNone. true (default)—A service area line that intersects a break is split into two lines. This is useful if you want to visualize service area lines by break value. false—Service area lines are not split at the boundaries of the breaks. Setting this parameter has no effect when only one value is specified for the defaultBreaks parameter or outputLines is set to esriNAOutputLineNone. true (true)—Services area lines can overlap one another. With this option, if two facilities have service area lines that are coincident, there are two features there—one for each facility's service area line. false—Service area lines from one facility cannot overlap those from another facility. With this option, if two facilities have service area lines that are coincident, then there is only one service area line, and it is associated with the closest facility. Setting this parameter has no effect when there is only one facility or outputLines is set to esriNAOutputLineNone. true—The input facilities are returned as part of the facilities property in the JSON response. false (default)—The input facilities are not included in the results. If you have specified the facilities parameter using a REST query request to any ArcGIS Server feature, map, or geoprocessing service that returns a JSON feature set, returning facilities can allow you to draw the facility locations in your application. You may also want to set the returnFacilities property to true to see where the facilities were located on the street network or, if they weren't located at all, understand what the problem was by checking the Status property in the JSON response. true—The input point barriers are returned as part of the barriers property in the JSON response. false (default)—Point barriers are not returned. Setting this parameter has no effect if you don't also specify a value for the barriers parameter. If you have specified the barriers parameter using a REST query request to any ArcGIS Server feature, map, or geoprocessing service that returns a JSON feature set, returning barriers can allow you to draw the point barrier locations in your application. You may also want to set the returnBarriers property to true to see where the barriers were located on the street network or, if they weren't located at all, understand what the problem was by checking the Status property in the JSON response. true—The input polyline barriers are returned as part of the polylineBarriers property in the JSON response. false (default)—Polyline barriers are not returned. Setting this parameter has no effect if you don't also specify a value for the polylineBarriers parameter. If you have specified the polylineBarriers parameter using a REST query request to any ArcGIS Server feature, map, or geoprocessing service that returns a JSON feature set, the returnPolylineBarriers parameter can be set to true so that you can draw the polyline barrier locations in your application. true—The input polygon barriers are returned as part of the polygonBarriers property in the JSON response. false (default)—Polygon barriers are not returned. Setting this parameter has no effect if you don't also specify a value for the polygonBarriers parameter. If you have specified the polygonBarriers parameter using a REST query request to any ArcGIS Server feature, map, or geoprocessing service that returns a JSON feature set, the returnPolygonBarriers parameter can be set to true so that you can draw the polygon barrier locations in your application. Specify whether invalid input locations should be ignored when finding the best solution. An input point is deemed invalid by the service if there are no streets within 12.42 miles (20 kilometers) of the stop location. true (default)—Any invalid point in your request will cause the service to return a failure. Use this parameter to specify the spatial reference of the geometries, such as line or point features, returned by the service. The parameter value can be specified as a well-known ID (WKID) for the spatial reference. If env:outSR is not specified, the geometries are returned in the default spatial reference, WGS84. See Geographic coordinate systems and Projected coordinate systems to look up WKID values. Many of the basemaps provided by ArcGIS Online are in the Web Mercator spatial reference (WKID 102100). Specifying env:outSR=102100 returns the geometries in the Web Mercator spatial reference, which can be drawn on top of the basemaps. Use this parameter to specify by how much you want to simplify the service area geometry returned by the service. Simplification maintains critical points of a geometry such as a service area or a service area line to define its essential shape and removes other points. The simplification distance you specify is the maximum allowable offset that the simplified geometry can deviate from the original geometry. Simplifying a geometry reduces the number of points that are used to construct the geometry. This reduces the overall response size and also improves the performance for drawing the geometries in the applications. The default value for this parameter is 10. The units are specified with the outputGeometryPrecisionUnits parameter. Use this parameter to specify the units for the value specified for the outputGeometryPrecision parameter. Specify additional settings that can influence the behavior of the solver when finding solutions for the network analysis problems. The default value for this parameter is no value, which indicates not to override any solver settings. Overrides are advanced settings that should be used only after careful analysis of the results obtained before and after applying the settings. A list of supported override settings for each solver and their acceptable values can be obtained by contacting Esri Technical Support. The JSON response from the service area service is based on the following syntax. The actual properties returned in the response depend upon the request parameters. For example, the facilities property is returned only if the returnFacilities parameter is set to true. If a request fails, the JSON response only contains the error property. The examples in the subsequent section illustrate the response returned with specific request parameters. JSON response syntax for failed request. The table below lists the limits that apply to this service. The 15-minute limit applies when generating detailed polygons (outputPolygons = esriNAOutputPolygonDetailed. The 15-mile limit applies when generating detailed polygons (outputPolygons = esriNAOutputPolygonDetailed. This example shows how to calculate the 5, 10, 15 minute drive time polygons around a store. The store location is specified as the facilities parameter using the longitude and latitude values. The drive-time polygons need to be drawn on an ArcGIS Online basemap that uses the Web Mercator spatial reference. Hence, the outSR parameter is specified with a value of 102100 to return polygon geometries in the appropriate spatial reference. The default values for all the other parameters are appropriate for this request and are not specified. The response contains three drive-time polygons around the store location.